One of the most popular street runs in Richmond is this jaunt down the length of Monument Ave, where runners can take in a variety of statues commemorating Richmond’s vibrant history. The road begins at the Robert E. Lee Memorial (At Monument and North Allen Ave). From here, it stretches west for about 1.6 miles, passing monuments to Confederate Civil War veterans J.E.B. Stuart, Jefferson Davis, Thomas “Stonewall” Jackson, and Matthew Fontaine Maury. 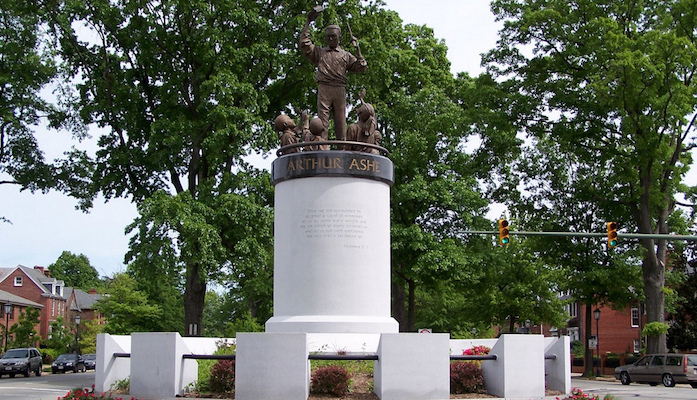 The final statue in the chain is of Richmond’s native born tennis star Arthur Ashe. The road continues for several miles after the officially designated Historic District, and there are some nice houses to look at, but the sidewalk peters out just past the Willow Lawn area (about 3 miles in). An out and back through the Historic District is a solid 5 km. Monument Ave is also home to a 10 km race each April which is considered one of the best running events out there. Monument and North Allen Ave.